Mindstorms Mayhem team members Nathan Streeter, left, and David Schunemann use a book magnifier at the Nashua Public Library. NASHUA - Did you know your local library has a lot of technology and equipment to help you even if you have a disability? Everyone should be able to use their local library, because the library is an important source of information and enjoyment. Libraries have books, public Internet access, books on tape and CD, DVDs and videos, magazines, computers, museum passes and other resources available for loan. 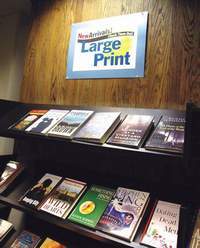 Many local libraries have sizable collections of interesting large print books and magazines, and the larger libraries may have some Braille books. The Nashua Public Library and the Wadleigh Memorial Library in Milford have computer programs like JAWS for Windows which provides speech technology that works with the Windows operating system to access popular software applications, the Internet and e-mail. Another program, MAGic, helps those with low vision view information on their computer screen with magnification up to 16 times, while hearing it through their speech synthesizer. Additional book magnifiers are available for visually impaired patrons that magnify the text on any printed material. At the Nashua Public Library, Paul Lacroix is available Wednesdays through Fridays to volunteer knowledge and training in learning JAWS and MAGic. 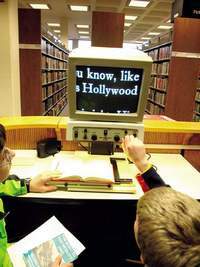 Nashua Public Library has other assistive technology like the Aladdin Ambassador Book Reader. The Aladdin Ambassador assists the blind or visually impaired by reading aloud to them. It uses character recognition when it scans a book or other printed materials and can keep the text in its memory for a long time. Because of this special technology, the Aladdin Ambassador can read a book that was scanned days ago. Nashua also has one TTY device for people who can’t speak and some MP3 players for audio books. Nashua Public Library has a van for Outreach Services. This service brings books and other library materials to the homebound, persons with disabilities, residents of elderly housing, and others in the community who have difficulty visiting the library on their own. 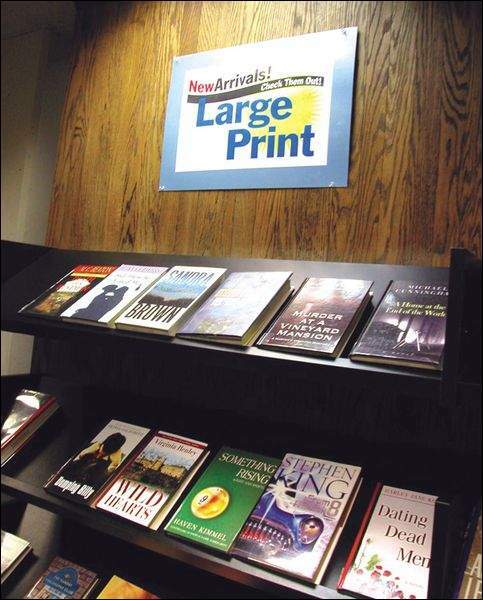 Local libraries have added many new items that assist people with disabilities, including the large-print books shown above from the Nashua Public Library. Another resource, the Talking Book Library, is a federally-funded program that lends a wide variety of books and magazines, recorded by professional actors. Most of these are produced by the Library of Congress. A full catalog is available online. Librarians can assist eligible patrons (those who are physically unable to see, handle or process printed material comfortably) to fill out an application. The majority of local libraries have ramps, elevators, automatic doors, accessible water fountains, bathrooms and walkways. Some libraries have specialized keyboards that can be borrowed to assist people with Parkinson’s disease, shaky hands or paralysis. Stools and helpful librarians are available to assist in reaching a book. This information was compiled by Mindstorms Mayhem, a FIRST LEGO League Robotics team. In doing researching for this year’s challenge “No Limits,” the team learned a lot about their local libraries and people with disabilities. They would like to encourage people with disabilities to “check out” their library and see what’s new. For more information about the Nashua Public Library, go to www.nashua.lib.nh.us. For more information about assistive technology at Nashua Public Library contact PLacroix@adelphia.net. For more information on Nashua Public Library outreach services go to www.nashua.lib.nh.us/outreach.asp. For information on the Talking Book Library in New Hampshire, call 800-491-4200. For more information about Mindstorms Mayhem, go to www.mindstormsmayhem.org. Mindstorms Mayhem is a FIRSTLEGOLeague team made up of homeschooled students from the area. The article resulted from research they did while preparing for the FIRST LEGO League New Hampshire State Tournament that took place Saturday at Nashua High School North. The team is coached by Ken Streeter and Bill Gray.